Created on Nov. 21, 2012, 9:10 p.m. by Hevok & updated by Hevok on May 2, 2013, 4:57 p.m.
Somatic cell nuclear transfer (SCNT; animal cloning) creates a newborn clone derived from an old, differentiated cell [Briggs & Kings 1952; Elsdale et al. 1960; Wilmut et al. 1997]. SCNT resets the developmental potential of somatic nucleus back to totipotency from which the whole development can be recapitulated. 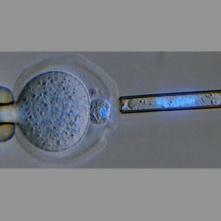 The resulting new borne clone is genetically identical to the somatic cell transferred into the recipient oocyte. The clone does not inherit the age of the donor even if the donor was already old [Mizutani et al. 2008; Wakayama et al. 2010]. In such the age-associated changes present in an aged cells can be reversed. SCNT indicates that mechanisms exists that rejuvenate cells. Briggs, R. & King, T.J. (1952) Transplantation of living nuclei from blastula cells into enucleated frogs’ eggs. Proc. Natl Acad. Sci. USA 38, 455–463. Elsdale, T.R., Gurdon, J.B. & Fischberg, M. (1960) A description of the technique for nuclear transplantation in Xenopus laevis. J. Embryol. Exp. Morphol. 8, 437–444. Wilmut, I., Schnieke, A.E., McWhir, J., Kind, A.J. & Campbell, K.H. (1997) Viable offspring derived from fetal and adult mammalian cells. Nature 385, 810–813. Mizutani, E., Ono, T., Li, C., Maki-Suetsugu, R. & Wakayama, T. (2008) Propagation of senescent mice using nuclear transfer embryonic stem cell lines. Genesis 46, 478–483. Wakayama, S., Mizutani, E. & Wakayama, T. (2010) Production of cloned mice from somatic cells, ES cells, and frozen bodies. Methods Enzymol. 476, 151–169.